Silicone Rubber Keypads with Epoxy Keypads | Northpoint Technologies Inc.
An Epoxy coating can be applied to conductive rubber keypads to give the keypad a hard plastic feel. 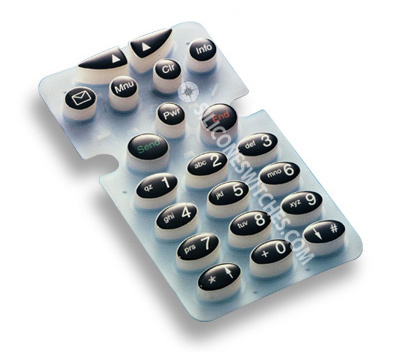 This method is used as an alternative to producing custom keypads with plastic keytops. The costs associated with producing a custom keypad with an epoxy coating are significantly less when compared to the costs associated with producing a custom keypad with plastic keytops. Applying an epoxy crown to keytops is both visually appealing and economical. Northpoint Technologies can help you in incorporating the application of epoxy crowns into the design and manufacture of custom silicone rubber switches.